I posted a photo of a beet on my facebook page the other day. A friend asked, “what is that and what does it taste like?” My reply was, “it’s a beet and it tastes like a beet.” I love simplicity. Many believe that the name tepary comes from the Tohono O’odham phrase t’pawi meaning”it’s a bean”. I first learned about tepary beans from my food hero, Gary Nabhan. In Coming Home to Eat, Gary touted the ability of tepary beans to grow in an arid climate and their high protein juxtaposed a low glycemic index. Apparently, long ago they were grown by many of the Native American desert communities. Tohono O’Odham translates as ‘people of the desert’ but this tribe was formerly known as the Papago, from the Spanish word Papabotas or bean eaters. They’re closely related to the Pima tribe, also known as the Akimel O’Odham, who hold the unenviable distinction of having the highest rate of diabetes in the world. Recent research reveals that more than 50% of all tribal members over the age of 35 are diabetic. These tribes aren’t large. The 1990 census counted less than 32,000 members between them. But because of their high rate of diabetes, they have an importance far greater than their numbers would indicate. Each benefits from the work of Native Seeds/SEARCH. The acronym stands for Southwest Endangered Arid-Lands Resources Clearinghouse. Gary Nabhan and Mahina Drees, founded this non-profit in 1973. They sent staff to remote corners of the desert, on foot and on mule, to recover seeds. One of those seeds was the tepary bean. Native Seeds/SEARCH discovered that many of the Native American desert communities had lost their traditional methods of farming and their seed stock. They heard from the Tohono O’Odham that they would like to grow the crops of their ancestors. Since then, Native Seeds/SEARCH has become a major regional seed bank and a leader in the heirloom seed movement. Its seed bank includes 1,800 collections, many of them rare or endangered. More than 90 percent of these crop varieties are not being systematically preserved elsewhere. 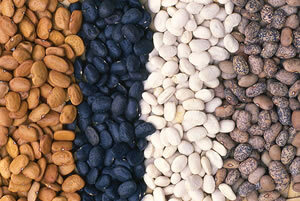 The tepary beans are Native Seeds best seller but their current supply is only 41 bushels. That’s far fewer than the 150,000 bushels grown in California alone in 1917. These beans may be making a comeback in the diet of the peoples of the desert. They have in my home and I was particulary happy to see them on the menu of a new downtown hotel in my area. If they do come back, it will be largely because of the work of the dedicated people at Native Seeds/SEARCH. The organization’s Desert Foods for Diabetes project promotes the production and consumption of traditional desert foods to combat diabetes. Teparies have a wonderful nutty taste that I enjoy. Even after soaking, they take longer to cook than other beans sometimes resulting in what my kids call, “the crunchy beans”. I love to fix them with traditional Mexican spices of cumin, garlic and Mexican oregano. Be forewarned, however, that these beans are tiny and come with a lot of pebbles and dirt. You need to wash them with a couple of changes of water to clean them up before cooking. Clearly tepary beans aren’t local to everyone so please feel free to modify this recipe with your favorite. In a food processor, puree the beans, and garlic. Slowly add the 0live oil. When the desired consistency is reached, add the lemon juice, cumin and season to taste with salt and pepper. Serve with an assortment of chopped vegetables or pita chips. Ha, I remember the beet! 😀 (It didn’t look like one I’ve ever seen though, it was most similar to the tiny pink-outside / white-inside beets we have here (“Radieschen” which means little radish), but the ones I know don’t have stripes! It makes me very sad how many Native American tribes suffer from health problems like diabetes nowadays. I believe most of that is because they had to abandon their traditional diets, and got provided with white flour, canned sugary fruit, cheap oils, and things like that. It’s a shame. That is exactly how it happened and it can revert back with seed savers (and without Monsanto seeds). I’m very happy to hear something can be done, and there are steps taken into that direction! Check out the second Tohono Oodham link. It’s pretty cool. I had the priviledge of hearing Winona LaDuke speak at a Local Foods conference in Canada this weekend. She’s Anishinabek from a community in northern Minnesota, and has a PhD in economics from Harvard, and has been working on connecting the dots between living sustainably, using green energy, growing indigenous plants, and “de-colonizing” tastebuds. It was a privilege to hear her speak. That sounds amazing. It’s wonderful that she’s taking a leadership position. The Tohono Oodham have actually opened a restaurant which you can see through one of the links in the post. I’ve yet to go but can’t wait. I love any kind of bean, and even though I’ve heard of the tepary, I don’t recall using it any dishes. It sounds like a perfect use for the pressure cooker! hmmm. I wonder if it’s because they’re not native – perhaps you have better protection of biodiversity than we do. I’ll keep an eye out for these, Tammy. I love beans and am including them in our meals on more days than ever before ~ 15 bean soup (with cumin! ), red beans and rice (with fire roasted tomatoes, peppers, and onions), three bean salad, baked beans, hummus, bean burritos, pea soup, lentil soup, etc. They are so good and so good for us! Thanks! They are indeed and I love them. They are so full of fiber that they are so filling too. Very interesting and appetizing, Tammy! I am curious – when did the diabetes phenomenon start with the native peoples of the desert, and is their one root cause to the problem – such as abrupt change of diet, or the infiltration of processed “American” food? Love beans. Never heard of tepary beans, but I might be making that recipe with black beans – which I adore! The problem began when they began eating the SAD (standard American diet). This recipe will work just fine with black beans too. Enjoy. SAD! What an appropriate acronym! Excellent points! Growing native plants makes tremendous sense environmentally, financially, and medically. Our green revolution monocropping model is counter to such things though and it’s folks like you that are leading the wave to better health. I’m a fellow customer of Native Seeds/SEARCH and of their tepary beans. Great organization and well worth supporting! I’ll keep my eyes open for it. I really do want to go to the restaurant. I’m absolutely fascinated with the diet of the native peoples; it was GMO-free, organic, seasonal, local, nutritionally diverse, respected the environment and biodiversity, and was grown without any petroleum, chemicals, or mechanization. Brilliant! Wendy Hodgson of Desert Botanical Garden did a brilliant and exhaustive book called “Food Plants of the Sonoran Desert” that you may still be able to find used. We’d like to visit the restaurant too! A look at their menu though showed that there was nothing vegan, which means that their menu items are a blend of old and new meant to better appeal to modern palates. Honestly that’s understandable; many of the native foods I’ve tried that were true to their origin reflected a taste very different than the fatty and artificially sweetened foods that we are now accustomed to. wow, I know Wendy and I will check this out. Honestly, I may have looked at it in the past. Took my kids to Green last night and they enjoyed it. 😳 I mean, is there one root cause. . .
Tammy, you are a wealth of information for us. What you are doing and supporting is making a difference, an important one. I would never have thought of these things and known about them if not for you. Thank you so much! Praying for the native American people and the hope that Native Seeds/SEARCH is bringing for us all. You’re a good soul Debbie. They can use your prayers. I wish there was some organization working for our people In Rajasthan. I dont know what tepary beans are called in Hindi but I would definitely like to include this in our diet. Indians have somewhat unhealthy eating habit and end up being obese. i’ll try and find this out. so, I found an India Agriculture site that mentions them but I can’t see if they are available or even for sale. There are many restaurants/chefs who are using lesser-known, unique foods and thereby introducing them to the general public. I personally will seek out restaurants with interesting menus and try something new. A good chef can do amazing things with something a simple as a bean. Yes, I seek out restaurants that are using local ingredients (not always but often). Now: I wonder how a Brit gal like me goes about gettin’ her hands on a pile of tepary beans? Honestly Kate, your weather probably would be too wet for them. If you email an address, I’d be happy to mail you some to cook but I’m not hopeful that they’d grow. this post gives me hope – maybe we’re not headed toward an Idoiocracy in the US…. There are some wonderful people doing great work. I love this idea of bringing the native seeds back to the Native Americans. And I would love to try the tepary beans sometime! Thanks for enlightening us, Tammy. You’re welcome Renee. This is probably somewhat similar to those broad beans that we ate in Peru when the diet hasn’t been modernized. Tepary beans looks and sound delicious. Healthy too. I also love the color combination of the beans in the picture. Like a fusion of the Earth and the ocean….jus calming and refreshing. Thank you. Have a beautiful day…. You too. The group Native Seed SEARCH actually had to recover each one of those seeds individually. Knew we had a similar sense of humor! The beans would probably be good in a curry too. Tammy, your research and historical information always amazes me. I learn something new here every time. I saw an “ancient grain” bread in the bakery yesterday and wondered about that… seeds and grains with ancient pedigree. It would be an honor to ingest such a thing. It is an honor! That’s the right way to look at it because it is taking so much effort to keep the biodiversity that we have. Sounds delicious and also, what a lovely, informative post. There are so many beans out there. Such a humble food. I love hearing about organizations like Native Seeds/SEARCH and Desert Foods for Diabetes. There is some educating to be done, but hopefully more and more people will learn how simple and inexpensive it can be to make healthy food. Yes and become rich in health in the process! I’ll bet you do have a seed saving organization in Australia. Beets are in here! I’ve heard of those beans before but have never seen them. I’d love to see a wider variety on menus. Yes, I’m really try to frequent restaurants that will provide things like tepary beans and local foods. I purchased the tepary beans at Native Seed Search last month when I was in Tucson. I also purchased some tepary bean hummus at Singh Farms last Saturday and MMM it is GOOD. I cannot wait until I grow my own beans and make my own hummus! I have also found the beans for sale at the farmer’s markets in the Phoenix area. Then once we all start growi ghese kinds of foods we can save some of the seeds (beans) and share them and use them again in our own gardens, thereby creating a strain of the plant that builds up a strength for the climate in your specific yard! So very cool that WE can be part of thesolution – no longer do we need to look out side ourselves! I can remember that my grandparents saved their seeds but I had no idea about the importance of it then. Such an excellent post. I haven’t heard of this tribe, or their preferred bean. I wonder if Rancho Gordo, which takes on many heirloom bean projects, is aware of this one. A quick google shows that they do have Tepary beans but I had not heard of Rancho Gordo before – thanks Nancy. I agree with Kath (my funny life) and you know….even we ‘white’ people have the same trouble…I grew heirlooms for several years to help along native seed projects. It’s a worthy cause, I do believe to do so. I love coming here. You are a wonderful teacher. Just want you to know that through knowing you, you’ve inspired me to be more mindful of the food I eat and feed my family.Today I received my first “box” of local food from a local co-op. We’ll receive weekly boxes of seasonal, local produce. Your blog provided one of the many nudges I needed to make this change for our family. Thank you! That is such a lovely comment Jane. I love visiting your blog too for your quick wit, parenting and great writing. I’m happy to have been part of the inspiration for you to try out some local farm products. Come back and visit for ideas on how to use them. A fascinating post. I’ve not heard o f tepary before, it’s interesting to read about their history, the makings of a comeback and the need of people to eat the foods that their ancestors ate. Yes, it’s a hopeful comeback! That was so interesting Tammy – thanks for telling us all about the history. You’re welcome June. Thanks for reading it. You know the first time I cooked garbanzo beans, they came out crunchy too. That definitely taught me to test beans before taking them off, even if it seems like they’ve been cooking forever! I know what you mean! I’ve done it with several types of beans. It’s always so fun to work with heirloom/traditional foods, although we’re not even remotely arid so I don’t know how they would do here. I’ve mostly grown European beans, but it’s quite satisfying to see the different colors and flavors develop. This year, I’m going to start trying to save and grown less common potato varieties. When I went to Peru last year, the potato varieties were what really struck me. Here, we have red potatoes and I love them but now I’m aware of so much more variety. Would love to see what you are growing. A wonderful post & I learned a lot, again! Everytime, I come here & I learn a lot from your great posts! This bean hummus sounds so good to me! You know, it’s so strange but yesterday when I went to the market, they were giving samples of white bean hummus. It was also really good. Do you know where I could find these beans (in MN)–preferably organic? I’m sorry. I do not but would have you try these to see if you like them.